Parties have already held preliminary talks, according to reports. 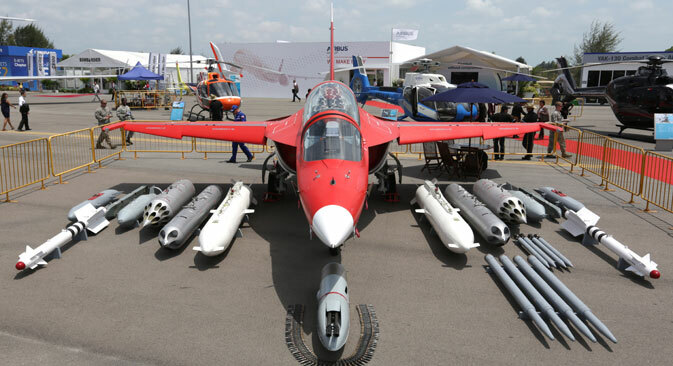 Pakistan could become the fourth country to operate the Yak-130 combat trainer aircraft, the website Defenseworld.net has reported, saying that Islamabad has expressed an interest in the aircraft. The website claims that the parties have already held preliminary talks. Industry sources told defenseworld.net that Pakistan Air Force officials have been talking to executives from Rosoboronexport and Irkut. The Yak-130 is designed for training flying school cadets in piloting skills and combat engagements against ground and air targets specific to fourth- and fifth-generation aircraft. For a training flight, the aircraft can be programmed to suit different weather conditions and take into account the specific type of aircraft for which the pilot is trained – from the Russian Su-30 to the US F-35 and the French Rafale. Pakistan’s acquisition of the Yak-130 would be the second purchase the country has made of Russian aircraft. In 2014, Russia lifted its arms embargo against Pakistan, and a contract for the supply of four Mi-35M transport and attack helicopters was concluded.